Setting the tone for the second decade of the 21st century, pianist Alex Brown kicked it off with a feature article in the January 2010 issue of Keyboard Magazine. His reputation continues expanding via his notable performances with everyone from innovative saxophonist Miguel Zenon to the legendary Wynton Marsalis and the Lincoln Center Jazz Orchestra. A member of Paquito D’Rivera’s ensemble since 2007, he shared in that ensemble’s 2010 Grammy nomination for D’Rivera’s album, Jazz-Clazz. Of Brown’s 2010 debut CD with his own ensemble, Pianist (Sunnyside), DownBeat magazine proclaimed it “A really fine record that leaves you wanting more.” This just a year after his 2009 graduation with a Bachelor of Music from New England Conservatory where he studied with Danilo Perez and Charlie Banacos, among others. Due to his diverse influences, Classical, rhythm & blues, hip-hop, Afro-Caribbean and Brazilian styles all co-mingle – naturally and infectiously – in Brown’s music. 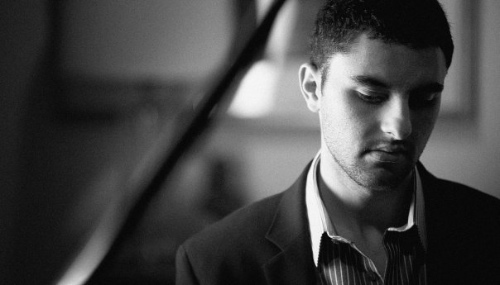 Alex Brown Trio at Terraza 7 on Wednesday February 4th , 2015, at 8:00 pm. No Replies to "ALEX BROWN TRIO"